Intel unveiled the Intel HD Graphics 620 with the Intel 7th Generation Kaby Lake Series Processors in September 2016. 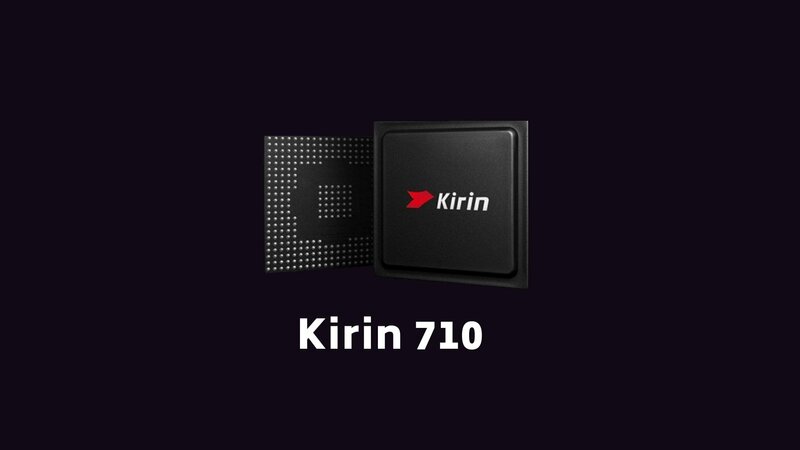 This GPU is present in the Intel Core i3-7100U, Core i5-7200U, Core i5-7300U, Core i7-7500U and the Core i7-7600U CPU. You are probably here because you own a Laptop or planning on buying one having one of these Processors. So if you want to know more about the performance and benchmarks of Intel HD 620, then you have arrived at the right place. Today, I’m going to remove all your doubts regarding the Gaming Performance of the Intel HD 620 Graphics Card. For gaming purpose, it is always recommended to opt for a dedicated Graphics Card. In a Laptop/Notebook, it is not possible to add a Dedicated GPU later on, so you need to select a laptop wisely. An example of the Integrated Graphics Card is the Intel HD 620 while that of a Dedicated GPU is Nvidia Geforce 940MX. If you’re looking for the performance of Desktop Graphics of Kaby Lake series, then check out: Intel HD Graphics 630 Full Review and Comparison. For the Integrated GPU of Celeron series and Pentium G4560, see Intel HD Graphics 610 Review and Benchmark. And you can also check out the performance of Intel’s 8th Generation UHD 620 here. 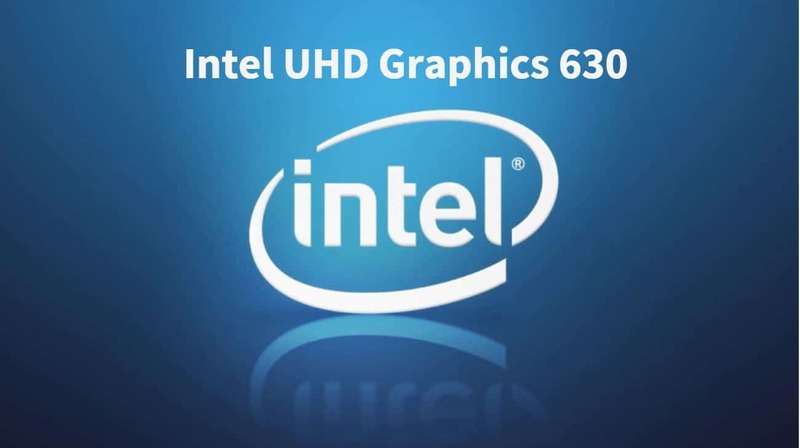 The Intel® HD Graphics 620 is an integrated GPU by Intel that is manufactured using the 14nm FinFET Process. It is the stock GPU of some of the Intel Kaby Lake Series Processors like the Intel Core i5 7200U. The base frequency of Intel HD 620 is 300 MHz which can go up to 1.0 GHz. It also has support for 4K video playback at 60Hz. Intel has made various improvements in their 7th generation integrated GPUs which has improved their performance to an extent. It has support for the latest DirectX version which is the DirectX 12. So, you can expect better performance in games that support DirectX 12. The processing power of this Integrated Graphics is 384 to 403.2 GFLOPS. It can support maximum 3 displays at a time. So, if you’re using a Laptop, you can connect 2 external monitors to increase the productivity. The rest of the specs are mentioned in the table above. 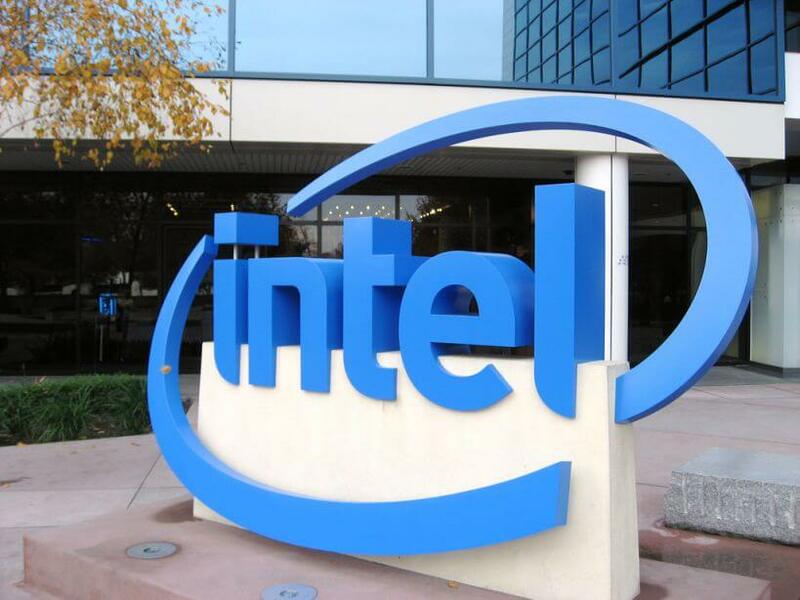 How much is the Intel HD Graphics 620 Video Memory (VRAM)? Intel HD Graphics 620 is an integrated Graphics Card. Hence its memory is dynamic. It uses the system’s memory which could go up to 32 GB. The Video Memory changes dynamically as per the requirement. It uses the system’s RAM as its video Memory. One can also change the Maximum Video Memory from the BIOS Settings. On the PassMark Benchmarking Tool, the Intel HD 620 Graphics scores 944 points. This benchmark scores clearly show that there is a huge improvement over the previous generations of Intel HD Graphics. It is now even stronger than the low-end Integrated GPUs by Nvidia & AMD. Let us have a look at all the benchmark scores. The Intel HD Graphics 520 is an integrated GPU of 6th generation Skylake Processors like Core i5 6200U while the Intel HD 5500 is present in the Intel 5th generation Broadwell CPUs like the Coe i5 5200U. Although there is not a vast improvement over the last generation, still the Benchmark Score has doubled if we compare it with two generations old GPU. The Gaming performance has certainly improved, and you would get better frame rates. Let’s hope to see an even better Integrated GPU in the upcoming 8th Generation! Nvidia Geforce 910M & 920M are the cheapest GPUs from the Nvidia Geforce 900 series, and you must avoid them at all costs. The integrated GPU Intel HD Graphics 620 is much better when compared to them. Now, there’s no point of buying a Notebook with a weak dedicated GPUs like one of these. AMD Radeon R5 M430 & R7 M445 are low-end and mid-range Graphics Card from AMD. With Intel HD 620 leading again suggests that there’s no point of buying a Laptop powered by an AMD R7 M445 or R5 M430 GPU. Though the R7 M445 is equally good and might be even better in real-world performance, still, I would advise you to avoid it. Instead of choosing either of these, I would suggest you go for a better GPU like the Geforce 940MX. Or you can also simply stick with the integrated graphics instead of paying extra for these GPUs. Finally, here are some GPUs that perform better than the Intel HD 620 Graphics. The Nvidia Geforce 940MX and 930MX score higher than the former and do a better job in the Intel HD 620 vs. Nvidia Geforce battle. So are you wondering how much difference would those 300 points make in real-world performance? Well, on my HP AU111TX, with the Nvidia 940MX, I get 60 fps on GTA V at medium settings and around 35 fps when I switch to the Intel HD 620. 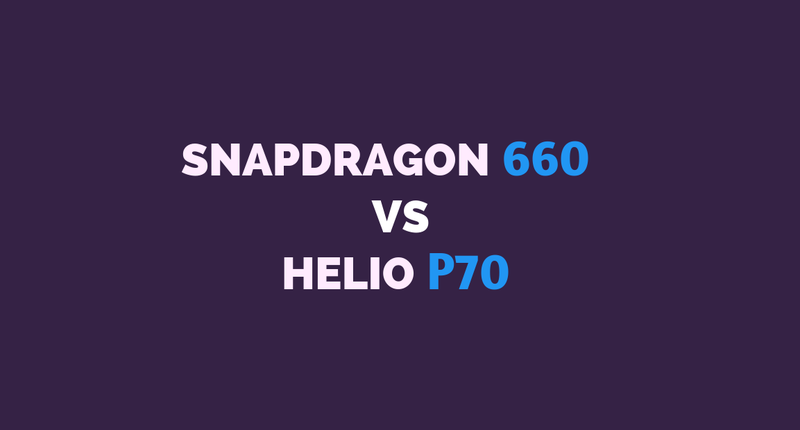 This FPS difference should remove your confusion regarding the performance difference between HD 620 & 940 MX. In the above chart, you can see a long list of games I’ve tested with the Intel HD Graphics 620 on my laptop HP Pavilion AU111TX. The resolution in these games was 1366×768 and the graphics settings were either low or lowest. Most of the games I played with this GPU were not so high demanding games. To show you a list of games that can be played, I tested only those games of which I was certain that it will run at a playable frame rate. GTA V, CSGO, The Elder Scrolls V: Skyrim are playable and we have also discussed their gameplay in the next section. Games like FIFA 17, Rocket League, SIMS 4, and League of Legends can reach an FPS close to 60. If you’re a big fan of any of these games, then it’s a good news for you. You can play Overwatch at 42 frames per second on average. Batman: Arkham City, World of Warcraft, and Tomb Raider (2013) can be played at 45 FPS. Note that you can also easily run the predecessors of any of the games I’ve mentioned in the above chart. Batman: Arkham Origins is also playable but I cannot say the same for Arkham Knight. Unfortunately, you will not be able to play games like Rise of the Tomb Raider, and The Witcher 3. On Far Cry 3 and Fallout 4, the average FPS is 24 while it is 33 in the case of Crysis 3. On Fortnite: Battle Royale, you can expect around 30-40 frames per second on 720p. To find other budget cheap GPUs that can play Fortnite, check out: List of Budget GPUs for Playing Fortnite. You’ll have a hard time if you’ll try to play Far Cry Primal as it will not even touch playable FPS. But most of the older games launched before 2014 or 2013 should run fine without any issues. Want to improve the FPS in Games? Follow this guide. Video Editing, Rendering and other GPU intensive tasks are usually not recommended on an integrated graphics processor. Tools like AutoCAD and SolidWorks will work, but the experience won’t be good enough. There will be the same situation in case of video editing software like the Adobe Premiere Pro CC, Sony Vegas Pro, Camtasia Studio, etc. The rendering performance will be poor when compared to a dedicated GPU. So, if you’re a content creator or need to use GPU intensive tools, this is not for you. I’ll recommend you to buy some other Laptop with at least a decent GPU like the Nvidia 940MX or MX150. For even better performance, you can consider the GTX 1050 and the GTX 1050 Ti. As we have seen in the benchmarks, this GPU can play most of the not so high demanding games at HD resolution. The gaming performance has certainly improved over the previous generations. Considering it’s just an Integrated GPU, the performance is appreciable. But sometimes the benchmarks are not enough, you need gameplay videos to get an idea of the real-world performance. For casual gaming, the Intel HD 620 can be your best bet. But if you can spend a few more bucks then the Geforce 940MX would provide you better value for your money. To see how good this GPU performs in real life, you should check out the Counter-Strike: Global Offensive, GTA V and Skyrim Gameplay below. In this video, Counter-Strike: Global Offensive is giving around 50-60 frames per second on average at low settings and 1366×768 resolution. CS: GO performs quite well on an Integrated Graphics but as long as the settings are not too high and resolution is low. It will still be playable at 1920X1080 but, at a lower FPS. As you can see from the video, if you want to play GTA V, then you can expect an average of 30 fps. This performance is not bad for a Laptop without a Dedicated Graphics Card. Also, you should keep in mind that GTA V is a very optimized game. But that would not mean that Intel HD 620 can handle the new high graphics demanding games of 2016 and 2017. Games like the Arkham Knight, Witcher 3, Rise of the Tomb Raider would be unplayable on the Intel HD 620. To play these games on at least 30 fps, you would need Nvidia Geforce 940MX or better. With the gameplay of Skyrim, we can conclude that you will get around 35-45 fps. Other games released before 2015 should give similar performance as the GTA V and Skyrim. Games older than 4-5 years will easily give over 60 fps. 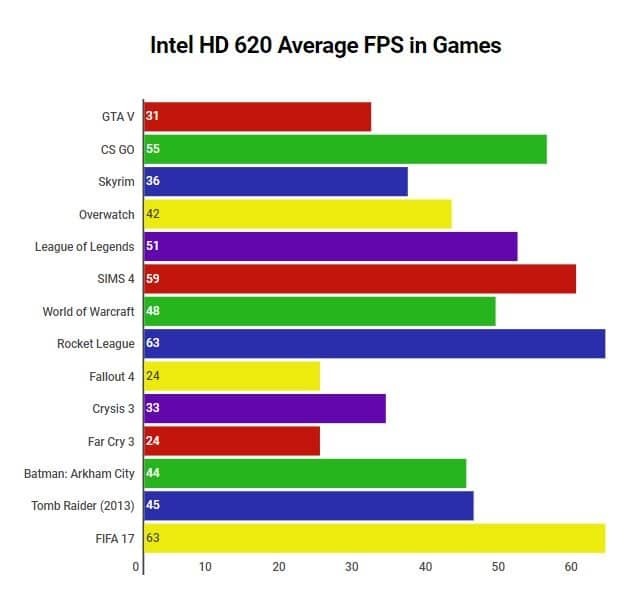 So the Intel HD 620 is not bad for casual gaming but also not that good for serious gaming. Here’s how it performs on the latest titles like Far Cry 5 on lowest graphics settings and resolution. You can download the latest driver for this GPU from your Laptop OEM’s website or from the Intel’s official website. This driver supports 64-bit Windows 10. Make sure to keep the driver updated to get the best performance. This is because the new updates usually fix up a lot of bugs and bring in many enhancements. My first choice will always be to assemble a PC if portability isn’t an issue. You should check out our Ryzen Build: Ryzen 5 Gaming PC Build Under Rs. 60K/$950. If you prefer Intel Processors, then you can go for Gaming PC Build Under Rs. 55K/$900. If you need suggestions on Laptops with 7th generation Core i5 Processor and Nvidia Geforce 940MX GPU, then I’ll recommend you to choose either HP AU620TX or the ASUS R558UQ. If you go with the Asus R558UQ, you should upgrade your RAM by 4 GB to get better performance while gaming. Nvidia has also announced the successor of 940MX this year and it goes by the name GeForce MX150. One good MX150 Notebook that I can recommend is Acer Aspire 5 A515-51G. A very interesting and informative article, well done. My graphics problem is directed towards photo processing however and I can’t find any articles that address the computer’s performance requirements vs; the particular photo editing program. My computer is the HP Envy touchsmart 17 notebook with the Intel 4600 integrated graphics. It’s an impressive workstation computer but the latest photo editing programs are becoming extremely graphics intensive and it appears as though they have surpassed my current demands, as the programs I’m using have the tendency to freeze or lock-up during some editing process. that appears would work for me and at a favorable price. This Laptop looks good specification wise however for your editing needs, I’ll recommend you to get a Laptop with Dedicated Graphics. At this budget (around $700), you will be able to buy Laptops that have the Nvidia GeForce 940MX GPU. Asus R558UQ and HP AU620TX would be a good choice. But if you can wait, then please wait for Nvidia GeForce MX150 Laptops to arrive. MX150 will deliver 4X the performance of Integrated Graphics. Very helpful, I just got that i5 7th gen. dell laptop and wasn’t aware of intel 620 graphics, it is good for doing programming and playing battlefield/assassins creed games I guess. Which game are you trying to play and you’re playing at what resolution and graphics settings? Also, make sure that in Battery Settings, performance mode is turned on and play while the Laptop is connected to power supply. hey i have i5-7200U 2.50 GHz and 8GB RAM , 1TB Hdd and it is with Intel 620 graphic card. recently i am trying to play GTA 5 and MAFIA 3 but it has been lagging a lot. i used resolution of 1280*720 and all other specs i have been using low but still they lag a lot . i am using HP 360 Signature Edition Laptop. Hi, Your specs are good enough to play GTA V at 30 FPS. Firstly, turn on the High-Performance Mode in the Battery and connect your Laptop to Power Supply. What is your current Graphics Settings in GTA V? Disable VSync, FXAA, MSAA, Anisotropic Filtering, Ambient Occlusion and turn all the other settings to low. Do similar settings change in Mafia 3 as well. Let me know if this has improved the FPS. Thank you for this article . I am planning to buy a laptop in coming week or two . I am a mechanical engg student and not much into gaming . 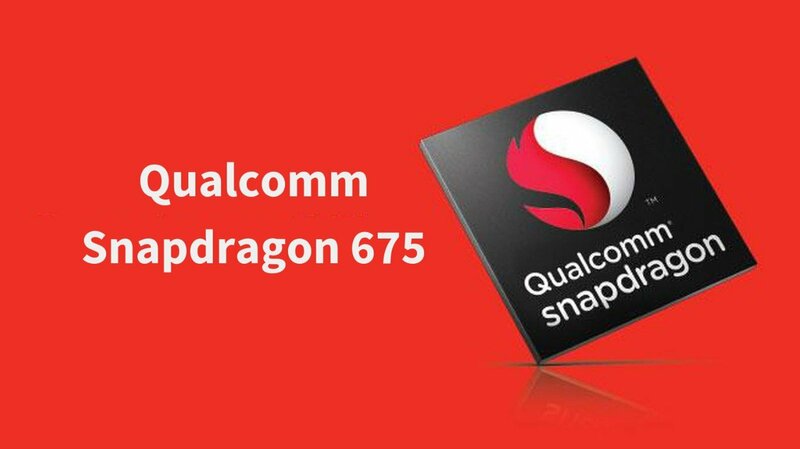 Will softwares like AutoCad /Cam / solidworks /freedom360 run smoothly on intel graphics 620HD (laptop specs- i5/7th gen 8gb ram). Will it be worth to spend extra bucks for Nvidia graphics card . Hi, these softwares you’ve mentioned can definitely run on the Integrated Graphics smoothly but having a dedicated GPU will result in a lot better performance. It all depends on how heavy or complex the task is. If you want to go for a Integrated Graphics, I would recommend you to get a Laptop with 8th Generation Intel Processor and Intel UHD Graphics 620. For dedicated Graphics, at least get the Nvidia GeForce 940MX or the new MX150. There won’t be any issues in Video Playback. 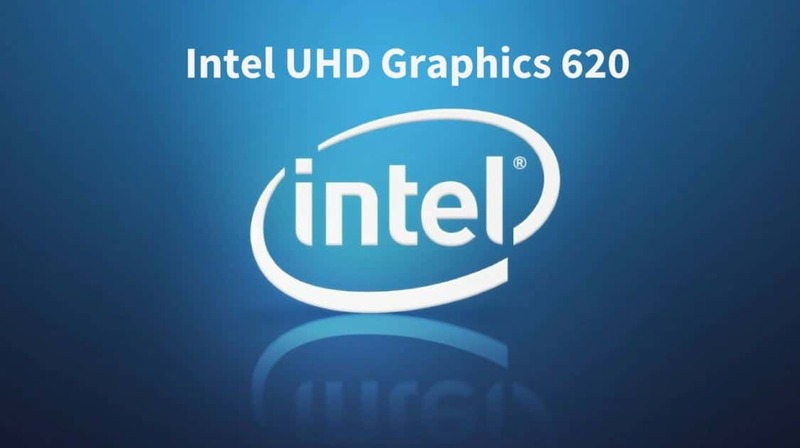 Intel HD Graphics 620 is capable of even 4K video playback! I would like to connect via hdmi an external 4K display .. I am not a gamer. Would this be supported and eventually support youtube in this resolution ? with this specs is it able to edit some photos on adobe photoshop ? Yes, for photo editing it is good enough. 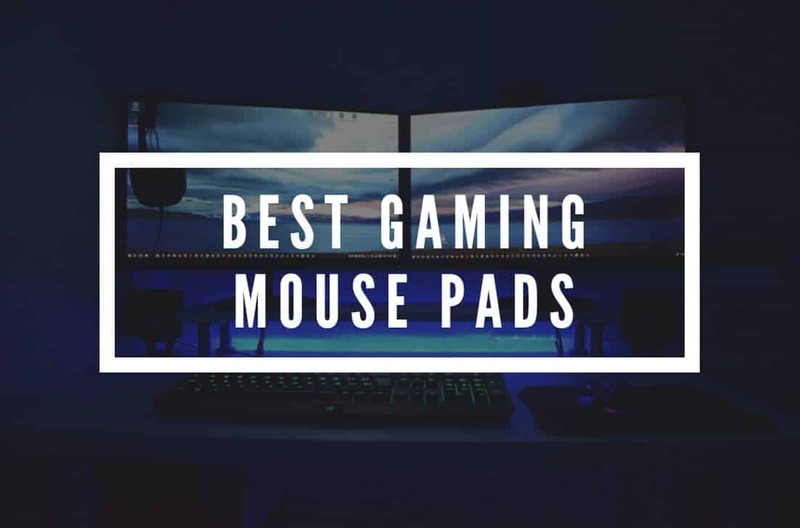 However, if you want to do any video editing or gaming in the future then I will recommend getting a Laptop with a decent dedicated GPU like the Nvidia GeForce MX150. Hi Kashish, I have an HP laptop with 4 GB RAM,i3 7100u @ 2.4 GHz & Intel HD Graphics 620.WOuld playing a game like AC Black Flag @ medium settings could do any damage to my GPU by overheating or anything? Please reply if you are able to.Also thank you for a very helpful article like this. It shouldn’t do any damage but if your laptop overheats after extended gaming, I’ll recommend getting a cooling pad. Thank you for this article . I am planning to buy a laptop in coming week or so . I am going in computer engg stream and not much into gaming .so which laptop should I buy hp pavallion 15 which has Nvidia 940mx 4GB or Dell Inspiron 13 which has intel UHD graphic 620.both has intel i7-7500u 16gb ram. Go with the one with a Nvidia 940MX. However, try to look for some new laptops with the Nvidia GeForce MX150. This GPU is even better than 940MX. 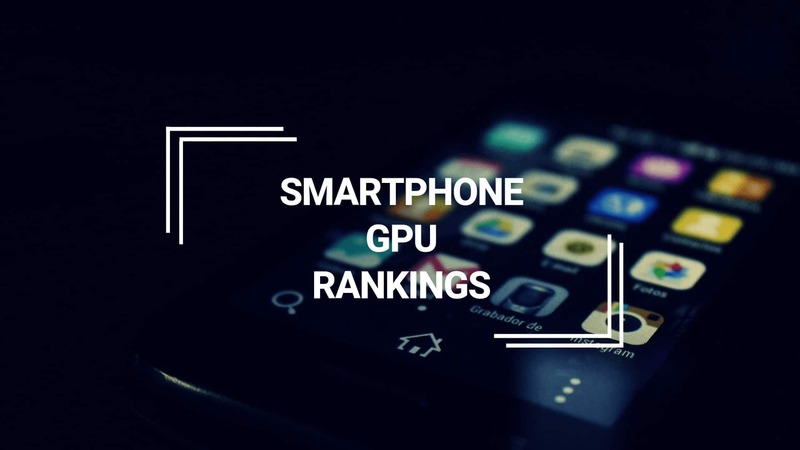 Even though you’re not much into gaming, a dedicated GPU can be helpful if you ever plan on rendering videos or to learn Machine Learning or basically any other task that can be improved with GPU acceleration. hey,I have a intel 620 graphic card,hp pro book440 G4, core i5 -7thgeneration. how can i improve my laptop to play fortnite??? 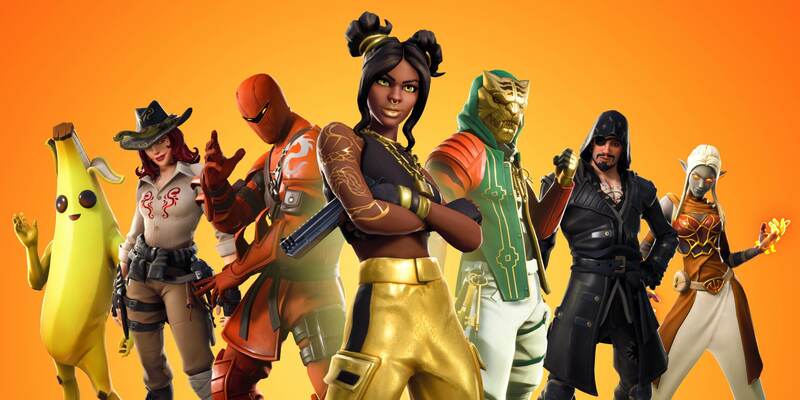 The first guide will you help to apply fortnite specific fixes and the second will optimize the Intel HD 620 of your Laptop. can i upgrade my graphic card ? if i can how far i can upgrade it ? Unfortunately, it is not possible to upgrade the Graphics Card in a Laptop. Though I haven’t played this game, the System Requirements are pretty low. I guess you should be able to play this game at high settings. But if you experience low frame rates, you can lower the settings. hey my laptop specs are i7 7500u at 2.7ghz to 2.9ghz 8gb ram and 2tb hardisk with intel hd graphics 620 so can i play assasins creed origins. Assassin’s Creed Origins is a really demanding game. I don’t think the HD 620 can deliver playable FPS in this game.